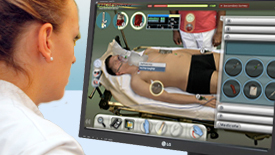 At January 15th 2016 VirtualMedSchool will present at the annual conference of ‘Nederlandse Vereniging voor Technische Geneeskunde’. For more information click here. At wednesday december 9th we will present about our (ad)venture VirtualMedSchool and serious game abcdeSIM during a meeting of the Rotary Rotterdam. Location RKZV De Maas Rotterdam.